Work Package 5 (WP5) aims to improve the knowledge and practice on health promotion and disease prevention across Europe. 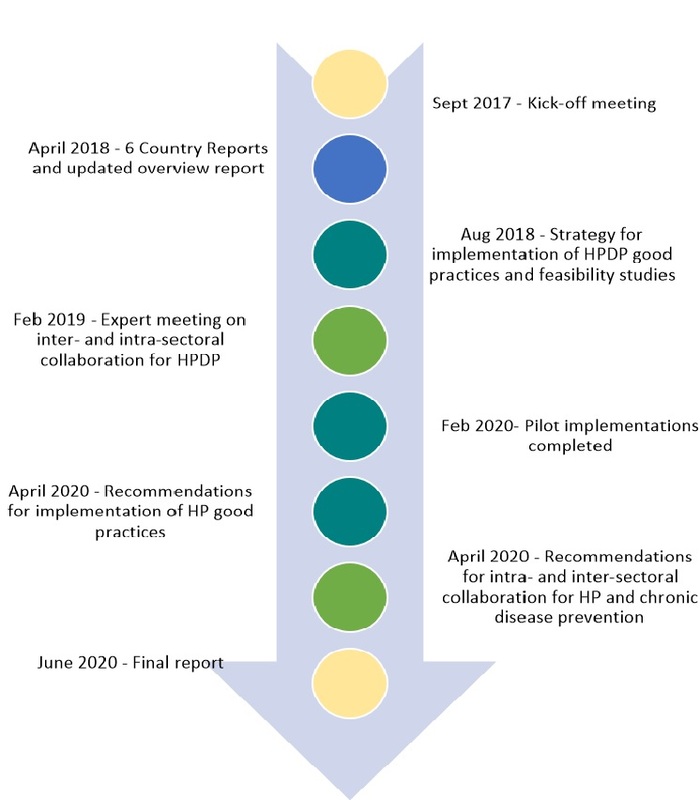 In recent years, health promotion and disease prevention (HPDP) have been proven to be cost-effective and efficient in reducing the burden caused by chronic diseases. and better integrating health promotion and disease prevention in the healthcare and wider social care systems. Who will benefit most from this activity? The primary beneficiaries will be practitioners, policymakers and other stakeholders, who can learn from results such as country reports, recommendations for the implementation and transfer of health promotion and disease prevention practices, as well as through intra- and inter-sectoral collaboration. 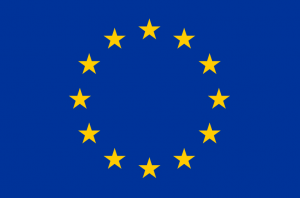 Ultimately, however, it will be European societies and citizens who will profit the most from healthier lives. ASL-TO3 (Italy), via the Piedmont Regional Health Promotion Documentation Centre (DORS) will transfer and implement the Irish JA-CHRODIS Good Practice “Active School Flag” (ASF) in at least two schools in the Piedmont SHE Network. This Network involves 100 schools in the region and aims to promote a whole school approach, to improve the health and well-being of all pupils as well as teaching and non-teaching staff. ASL-TO3 and DORS plan to propose the ASF to all schools in the network. This will include primary and secondary schools. In addition, they plan to implement the ASF in at least one school in a rural area and one in an urban area. This will be based upon voluntary recruitment. The aim is to compare and incorporate some of the Irish self-evaluation instruments in a locally specific context. The Institute of Hygiene (HI, Lithuania) works with a network of Public Health Bureaus who are the main institutions promoting and initiating the implementation of public health interventions at the municipal level in Lithuania. Two of the Bureaus (one rural, one urban) will appoint coordinators within pilot municipalities that will help to select schools, which will commit to enhancing the level of physical activity of their children through the development of a physically educated school community. The Directorate of Health (DOHI, Iceland) will implement (elements of) Dutch JA-CHRODIS Good Practice JOGG within the “Health Promoting Community Programme” (HPC). HPC is an umbrella for a comprehensive health promotion approach in municipalities. The main aim is to support communities and schools in creating supportive environments that promote a healthy lifestyle for all. The HPC currently covers 12 municipalities and 73% of Iceland’s population. DOHI wishes to use selected elements from JOGG to improve the quality of HPC work, including further developing the framework for HPC and schools, improving the programme materials and communication strategy, providing better training for coordinators, supporting further involvement of primary healthcare in HPC work, improving the evaluation plan and creating an online tool to collect practical solutions to support the HPC and the schools in their endeavours. The Directorate of Health and Disease Prevention Malta will implement the “ToyBox”-intervention in the first year of all state kindergartens, i.e. for preschool children aged 3-4 year.. This will lead to 2,500 children benefitting from the programme. Educators will receive the toolkit covering topics related to a healthy lifestyle. This includes healthy eating and snacking, water consumption, healthy food for healthy teeth, self-expression, and physical exercise. The Directorate will also implement the “ToyBox” evaluation component and carry out an evaluation on behavioural changes in the children by the end of CHRODIS PLUS. The Andalusian Regional Ministry of Equality, Health and Social Policies (CSJA, Spain) will implement elements of the Lombardy Workplace Health Promotion (WHP) Network into its own programme called ‘Promoción de la Salud en los Lugares de Trabajo’ (PSLT). The main aim is to re-invigorate the PSLT programme. Since 2012, the Andalusian PSLT Programme has involved nearly 200 workplaces (private and public), with more than 4,500 employees directly involved. The main elements identified in the Lombardy WHP Network to be piloted in the implementation within PSLT are: the WHP Network’s accreditation system, the UNI-ISO 26000 concept of sustainability, the online data collection system and relevant ideas for recruitment and long-term adherence to the programme. HI (Lithuania) will implement the Multimodal Training Intervention in two municipalities (one rural, one urban) through its network of Public Health Bureaus, which are the main institutions promoting and initiating the implementation of public health interventions. They are currently implementing a cardiovascular disease prevention programme in cooperation with family doctors who refer people at risk to a training programme. The bureaus organise the training programmes, facilitate lectures on nutrition and physical activity, and provide individual consultations to enhance lifestyle changes. 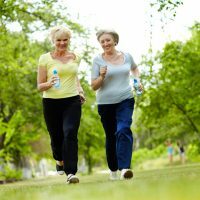 The main components of the intervention that are being considered for the implementation include the development of a training programme, which would be more suitable for older individuals to improve their physical fitness. ISCIII (Spain), collaborating with the Aragon Institute of Research in Health Sciences, will work on a pilot implementation of the Multimodal Training Intervention at three locations in Aragon. The Multimodal Training Intervention will be carried out at existing sporting facilities and community or social activity centres for over 65-year-olds. The activity, including participant input and selected reported functional assessments, will be conducted with a structure relatively independent from primary care but not from ethical evaluation . DOHI (Iceland) will implement the Multimodal Training Intervention in four municipalities, thereby ensuring a good mixture of villages, towns, and cities. The programme is promoted in geriatric centres, local papers and is open to everyone aged 65 and older. After each implementation phase (six months), the approach will be reviewed and adapted. The training phase includes daily endurance training (30 minutes) at least once a week with a trainer, and strength training sessions at least twice a week with a trainer. Training programmes are individualised, but participants will train together as a group and receive monthly lectures about nutrition, training, ageing and physiological changes. Costs arising from this intervention are covered by local authorities and other funding. A comprehensive evaluation plan is in place. we will update 14 existing country reports, developed during the first Joint Action on Chronic Diseases (JA-CHRODIS). Based on this input, EuroHealthNet and THL will produce a comparative overview including new health promotion developments and services. Special attention is paid to the target groups addressed by the HPDP implementations (see Task 2): children at school, adults in the workplace, and older people in a care setting. provide an understanding of what is needed in terms of health and other relevant policies and strategies (physical education, anti-smoking laws, employment policies, etc.) and in terms of implementation of good practices for the target groups. Six new reports, updated reports and an overview report to be published in spring 2018. In the first year, all partners involved will review and agree on the common framework for systematic assessments of their chosen good practice in relation to their context, including an analysis of the feasibility of the transfer. Additionally, partners implementing practices will conceive an action plan and assess and adapt the intervention to their local context. In the second year, good practice owners and non-implementing partners will support the new implementers and monitor the implementation process. Institute of Hygiene (HI, Lithuania). Directorate of Health and Disease Prevention Malta. Andalusian Regional Ministry of Equality, Health and Social Policies (CSJA Spain). Directorate of Health (DOHI) in Iceland. A real and sustainable impact on chronic diseases can only be achieved by applying an HPDP approach within the whole health system and also between different sectors that directly or indirectly influence health. Both intra- and inter-sectoral collaboration are important. 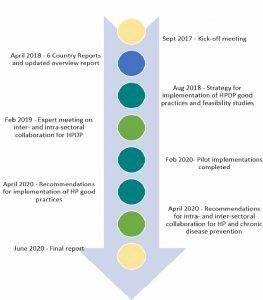 Integrated care should include HPDP to prevent and manage chronic diseases proactively and strengthen patients’ own roles in decision-making and disease management. Moreover, HPDP approaches that involve other sectors have proven to be more effective in general, whereas collaborations between health and social services in particular provide good opportunities to reach more vulnerable and/or disadvantaged populations who usually do not participate in health promotion activities, as these people often only use health (or social) services when poor health and related problems have appeared. 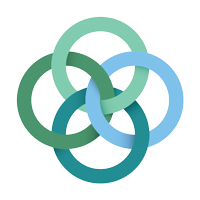 We want to identify the factors that facilitate and/or hinder collaboration between HPDP approaches within health (and social) care settings, examine efficient ways to work between the health and other sectors, and support synergies between community-based and healthcare services efforts. inter-sectoral collaboration between the broader health system and other sectors that provides opportunities for HPDP. Synthesise the insights gained by our work in a recommendations report. The findings and results of our work on HPDP in CHRODIS+ will be presented in a series of recommendations.